With gas prices soaring, we’re all looking to green up our driving these days, and eBay Green Driving wants to make it a lot easier for one person by giving them a brand new Toyota Prius! To enter, just share your own tips to make driving greener on Twitter or Facebook through the Green Driving site or simply view some of eBay Green Driving’s content. Not only will you be educating fellow drivers on how to save money and gas, you’ll also be giving yourself the chance to win a new green ride. Hurry, because the sweepstakes end on May 7th! Drive a Prius whenever possible. That's my tip. Green, clean, supremely comfortable. Real pleasure to drive with and excellent acceleration when you need it. Make mine a piano black one please! With gas prices soaring, we're all looking to green up our driving these days, and eBay Green Driving wants to make it a lot easier for one person by giving them a brand new Toyota Prius! To enter, just share your own tips to make driving greener on Twitter or Facebook through the Green Driving site or simply view some of eBay Green Driving's content. 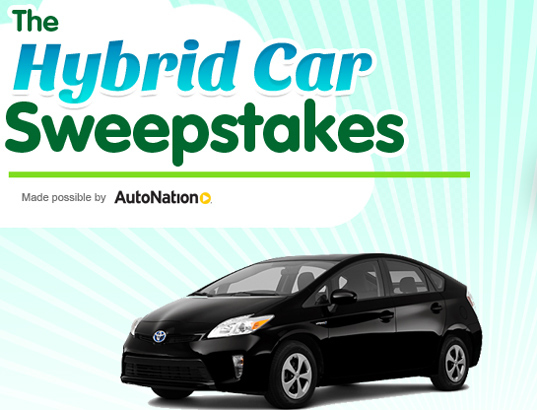 Not only will you be educating fellow drivers on how to save money and gas, you'll also be giving yourself the chance to win a new green ride. Hurry, because the sweepstakes end on May 7th!